In one of the most enchanting positions of Lake Maggiore in an oasis of greenery, flowers and palm trees lies the Camping Internazionale "Paradis". An ideal place for a quiet and comfortable holidays. The campground offers caravans and mobile homes for rent (dogs not allowed), a mini-market and a stylish bar. The toilets are modern and heated with attached washrooms, washing machines and dryers. Private beach with boat slip rental and buoys. In the direct area there are tennis facilities, mini golf and there is a sail & surf school and a boat hire kiosk. 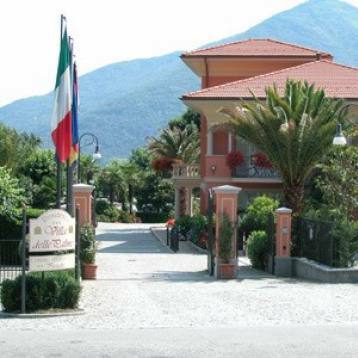 To the inside of the camp is located the beautiful residence "Villa delle Palme" consists of 9 rooms and 2 suites. Each room - elegantly decorated - has a balcony or garden. Private parking with video control system.